DJ Hero 2 comes at a time where the rhythm game genre is stepping aside to make room for the next generation of motion control games. The original game did not blow anything out of the water but I am sure glad that it sold well enough to warrant a sequel. 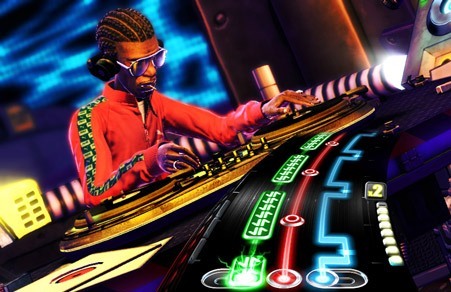 The small have had a butterfly effect on the sequel to make for some amazing changes that give DJ Hero 2 an overhaul in all the right places, without disturbing the addictive gameplay that the first game provided for us. If you are at all curious about scratching some fake records, or want a change from strumming and drumming then DJ Hero 2 is going to make you very happy. The fundamentals of DJ Hero 2 remain the same; tap, scratch and crossfade your way to huge multipliers and big scores. These basics remain strong and act as the base to which DJ Hero 2 builds upon. The most significant change is the freestyle “notes” that are strategically scattered throughout each mix. They consist of, you guessed it, freestyle taps, scratches, and crossfades, and although this may seem like a miniscule difference it alters the gameplay in DJ Hero 2 to make you feel like you have control over the mix . The crossfades give you the ability to cut back and forth between either track, the scratches allow you to move the record back and forth at your whim, and finally the freestyle taps have you hitting the red sample button (middle) to add your own personal flavor to the song. Each freestyle section is scored based on your rhythm and how well it fits into the song, so remember that more notes does not equal more points. Having the ability to give your own personal touch to each and every song goes such a long way that I was surprised this small change resulted in quite a large difference between the original and this game. I really enjoyed the freestyle parts of the song as I was able to make the experience unique to me and it felt like it was my song, my club, and my empire that I could manipulate with just one turntable. 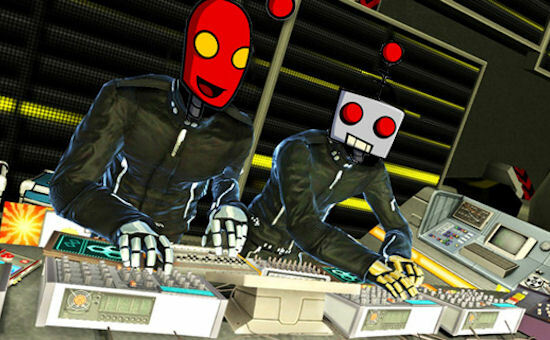 DJ Hero 2 also introduces some interesting but not ground-breaking modes to the series. Empire mode replaces the career mode and before I played the game I was geared up to begin creating my DJ regime all across the world. It is honestly a name change at best where you get to pick the name, symbol, and specific DJ before you head off to drop your beats in clubs across the world. Before long you are playing a series of mixes that is exactly the same as the first game. One change would be that the stages are split up into five different countries, each with their own marquee DJ that acts as the ‘boss’ to the level. In each country you are greeted with an intro mix from the likes of DJ Q-bert, David Guerra, the RZA, Deadmau5, Tiesto, and (my personal favorite) DJ Shadow. Once you earn enough stars in the level you can challenge the local star DJ to a battle, akin to Guitar Hero 3’s guitar battles. Beat the boss, move on - rinse, repeat. It is a nice change of pace from the regular gameplay but I would not want more than the half a dozen or so that I played throughout the game as they don’t replace the same feeling you get from the regular mixes.